Vincent Van Gogh, Café Terrace on the Place du Forum, Arles, 1888. Two colours, placed side by side, will appear differently depending on which colours are used and what they are placed next to. The effect of this interaction is called simultaneous contrast. Simultaneous contrast is most intense when two complementary colours are juxtaposed directly next to each other. For example, red placed directly next to a green, if you concentrate on the edge you will see a slight vibration. Orange and blue accentuate each other in Van Gogh’s Café Terrace on the Place du Forum, Arles, 1888 above. In Van Gogh’s painting, he has a very bold use of colour. If we start to analyze the piece we can see how he has used the power of complementary colours and the colour wheel to heighten the visual effect of simultaneous contrast. 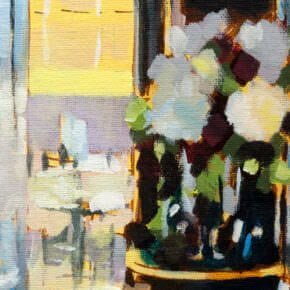 The rear windows – have a very strong saturated orange sitting right next to a pure french ultramarine, this causes the shimmering effect to give the evening window light a ‘glow’. The front of the cobbles – He has used this effect on a more subtle level where the small arches of orange and blue add movement, reflecting the movement and life within a cafe. Warm and cool colours – add a visual depth to it due to the fact that cool colour recedes into the background and warm colours come forward. In this example, Van Gogh has used complementary colours to his advantage and often went out of his way to create contrast and tension in his paintings. 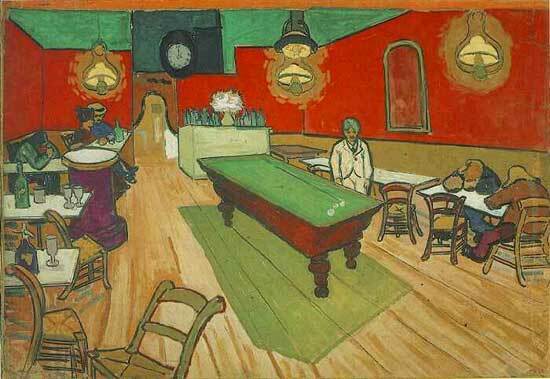 Vincent Van Gogh, The Night Café, Arles, 1888. However, the jarring nature of this visual effect is exactly that – jarring. 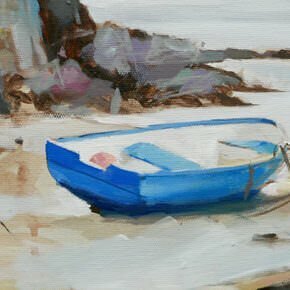 So, if you want to create a painting that is more harmonious you can still use these principles but on a more subdued level. In this Vermeer painting, The Milkmaid, we can also see the effect of complementary colours, albeit on a more subtle level. Here he uses an approach using split complements which in general will create a subtle effect. This is where you use one colour, for example, blue and instead of using its direct complement (orange) we split the colour wheel and use the next colour along. For this example, that would be a yellow-orange. This creates a nice visual balance, but also interest for our eye. The main point of focus of this painting is the milk jug. Vermeer has the milkmaid’s gaze looking directly at it so we naturally follow her gaze to the object. 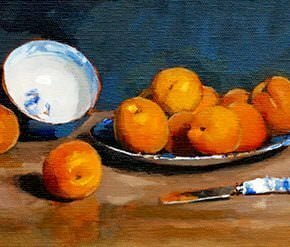 However, he still uses this visual effect by making the focus of the painting, the jug, a warm bright orange placed next to a bright blue of her dress to create a visual balance. So how can this help me in my choice of colours when painting? If you place a grey next to another stronger highly saturated colour, the grey will appear to have a slight tint of the surrounding or adjoining colour. 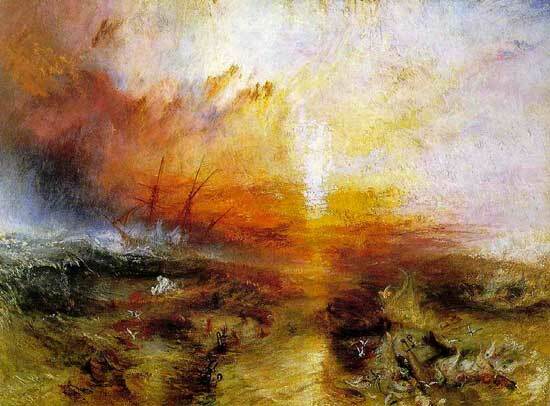 In Turner’s painting below you can see how he has used a muted blue background to emphasize the bright orange sunset. The actual paint colours are of course not altered; only our perception of them changes. The grey on the left will appear to have a slight tint of the surrounding or adjoining colour. Whereas the edges of the yellow square on the right have a ‘shimmer’ to them. Michel Eugene Chevereaul, a French Scientist, was working as the director of the dye works at the Gobelins Manufactory in Paris. Whilst he was working there he received many complaints about the colours of the dyes, Specifically how the blacks appeared differently when used next to blues. Researching this further, he realized that the yarn’s ‘perceived’ colour was being affected by the surrounding colours. This led to the idea of simultaneous contrast. Our perceived ‘memory’ of an object can be very strong. If a beginner learning how to paint places a banana under a red light it would cause our logical left brain memory some problems because we have such a strong memory of bananas being yellow. Even if we see them as red your brain tells you, this doesn’t feel right, so you change the colour to something you feel more comfortable with, and then the painting looks ‘wrong’. 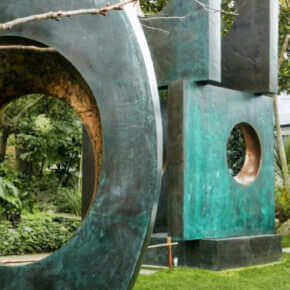 To try and counteract this effect artists often use isolated swatches of paint or viewfinders to try and perceive a colour on its own, in isolation, rather than trying to judge it next to another colour. So the next time you are creating a painting withhold judgment on your colour mixing prowess until you have all the adjoining colours next to each other. I often paint thin, more muted colours to start with and try and build up the whole picture at once. It then becomes easier for the eye to judge the correct balance of a hue. I leave the strongest, thickest paint for last, so I can choose exactly the tone and colour of the paint to pull the picture together. One of the biggest mistakes you can do is working on one small section to completion before addressing the picture as a whole. If you’d like to learn more about colour mixing, you should have a look at my simple colour mixing course. Thanks Anne, glad you enjoyed the article. will, I was wondering if there were any artists that you know of that only use complementary colours? Hi Josh, any limited colour palette like a blue and orange painting just uses complementary colours, here’s a demo of one. Thank you will I wasn’t to sure, I’m going to be starting my first year of gcse next week so iv been revising art types over the holiday, thank you again. Will, thanks so much for your articles, I have read a few of them this morning, they are easy for me to understand and full of information to help me along. I enjoyed this one on Van Gogh as my first ever acrylic painting (about a year and half ago) was after his Sunflowers painting. You’re welcome, great to hear they are helpful in your painting progress. Van Gogh is a really good artist to start with as he has such a painterly approach. I might do a tutorial on “how to paint like Van Gogh” what do you think? I am an Indian and where can I read your blogs….or updates…. So where can I join u? 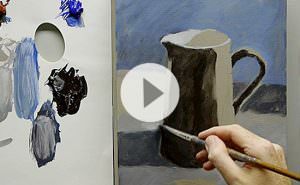 I think a “how to paint like Van Gogh” tutorial would be wonderful! Over the three or so months it took me to paint my sunflowers I really reflected on how much The Old Masters have to teach us and it was by doing that I really saw the brilliance of Van Gogh and how much more there is to learn. 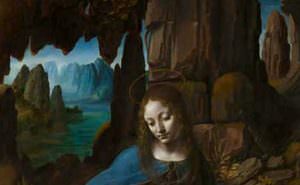 Studying an Old Master painting really can teach you loads! I’ll get working on a tutorial for ‘How to paint like Van Gogh” I think it will be great fun to do. Thanks again Will You-are a wonderfully teacher and love your sense of humour. I have read a load of different books and got more and more confused, You have sorted a lot out for me. Love hearing about split complementary. Would love a video of country landscape some where a bit wild in a lose style. Thanks again Sue. Great blog and awesome tutorials, keep it up. Thanks Ruby, pleased to hear it’s helped out with your homework. Greetings from the Land of Enchantment (New Mexico, USA). I am so excited to have run across your fabulous tutorials, and I can’t wait to get started tomorrow morning. I’ll work on the red cherry first and send you a pic when I’m finished. Hola Maria, enjoy the cherry painting tutorial, looking forward to seeing your results. 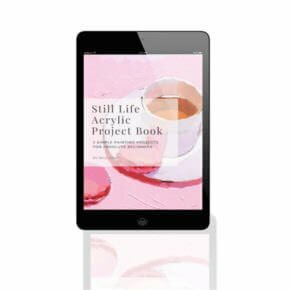 I just found your website and I can’t wait to get started! How convenient to work at home. Thank you so much for putting this school online. Hi Virginia, pleased you’ve found the website, enjoy exploring the articles and tutorials. Just wanted to thank you so much for all of the useful information. You are doing a real service here. Ive spent 35 years filming dolphins. Just startedbpainting and your site is brilliant. Checking outnyour tutorials. Probably color mixing will be my first. P.S. A phthalo blue with a green shade is a fantastic colour for creating brilliant turquoise seas. wow i love how when you know complementary colors it is so easy to see them in painting. Love these paintings you have on here by the way! I think your tutorials are wonderful and they really help me with alot of my work! Pleased to hear it Sundee. Thanks for dropping by Shaun, so pleased you’re finding the tutorials helpful in your painting. I’m taking Will’s color mixing course and it is helping a lot – starting with a proper ground color then setting out colors to get a sense of the balance. Great to hear it Hardy, pleased it’s helping with your paintings. Thank you so much. Van Gogh was the real deal. Can’t get enough of him. Thanks Kevin, really pleased you enjoyed the article. Just discovered your tutorials and im so so fascinated… love the way you make it all sound so simple. Painted my 1st acrylic yesterday and today i know why so many things went wrong (dint prep my canvas with ground colour, used my brush to mix colours, used a plastic palette to mix the colours… ugh!). Looking forward to learning from you. Thank you! Hi Nissy, really pleased you’ve been enjoying the lessons and congratulations on your first painting! Will, I’m doing a ground for a painting of an antarctic sunset. Foreground is deep purple with bg being orange and yellow topped by black/blue. I’m inclined to split the undercoating to a Payne;s grey for foreground and a yellow orange (light with plenty of white) for the sky/background. ??? Hi Hardy, yes that would work, just make sure to soften the line between the two when you paint them on so there is a subtle transition between the two. wow i really like this website i like your humor in your writing. im learning about comlementary colours to! I also use Easy Peasy allinone homeschool. You really help me under stand what to use these colours for. Good one Emma, pleased you’ve been finding the website helpful. I’m Jazmyn and I use Easy Peasy all in one Homeschool – it’s not as easy as it sounds. I am studying complementary colors and couldn’t really get the hang of it. Your article cleared everything up for me. So pleased to hear you found it helpful in your studies Jazmyn. hey i do easy peasy and this website really helped a lot.i am really into art. But i want to be a fashion designer when i grow up. i think that counts as art do you? Sure does count Hannah, pleased you’ve been finding the website helpful. Thanks! This is going to really “complement” my student lecture. Pleased to hear it Leslie. Very informative article! 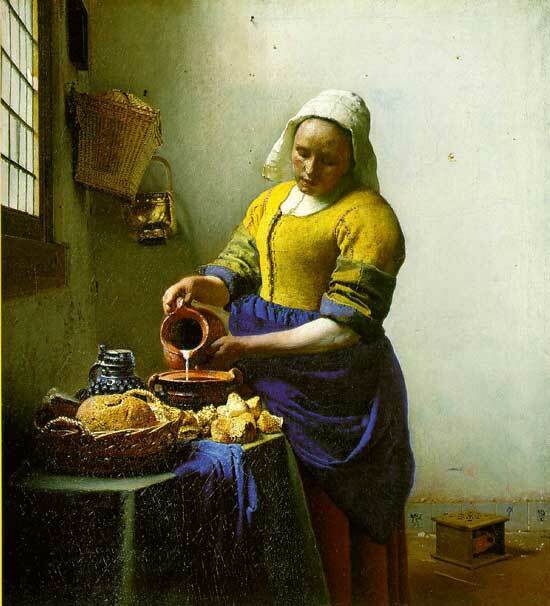 In photography we have yellow opposite to blue so Vermeer looks very natural to me. We also have no orange to adjust directly. Thanks for this posting. It just reminded me how to solve a problem painting a local marsh. There was not enough value contrast until I applied this maxim. Great to hear it Hardy. Hi Will. I stumbled upon your pages by accident, but what a great accident! I’m learning so much, and keen to keep on learning. 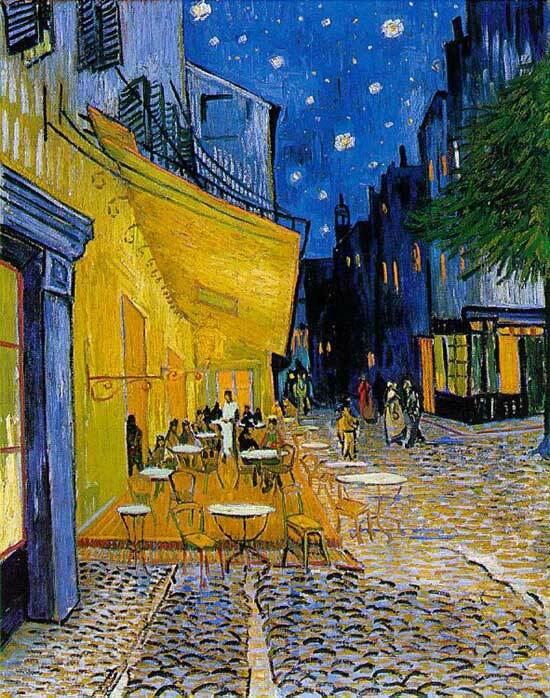 My current project is a copy of Van Gogh’s “Cafe Terrace at Night”, so I’ve found the notes and comments on this part of the site to be very useful. Many thanks! Really pleased you’ve been finding the articles of interest Alan, hope it helps with your project. I am very thanksfull about your Course Simply mixing , i learned very much from it. The opacity or translucency of a pigment is dependent on the chemical properties of the pigment. The only way to make an opaque pigment appear more translucent is to dilute the pigment with water or a medium. Wow! This is part of my homework and it helped, a lot! Thanks, Will!!! Will, I can see clearly now as the song says! I knew there was something I did not know about color theory! As you said, my paintings all looked like color enhanced pictures! I lean toward portraits but occasionally would attemp landscapes only to be disappointed. Now, for the third time, I will attempt a landscape for a commission work! Thank you! Great to hear it Linda, really pleased you enjoyed the article, hope the landscape painting goes well. read were great. I do Easy Peasy and I was wondering if you have any more stuff on complementary colors. Hi Gloria, pleased you found it helpful, here is a tutorial using the complementary colours orange and blue. I loved the paintings, Will thanks a lot!!!! 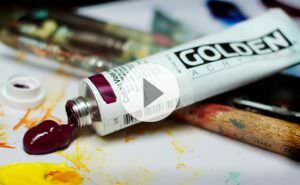 Hi I really enjoy your insight and lessons – Ive leant sooooo much and try to use my knowledge when painting. Thanks for sharing. hi this is so cool i love it and i’m not even that much of an art fan myself. Thank you so much for your free video to start. They are inspirational. I want to know how to paint beaches. I live in California and I can’t help it with out painting a beach. I have hard time to choose colors. Pleased you’ve been enjoying the lessons Zaineb, a Naples Yellow or Yellow Ochre can work wonders for a beach scene. Great tip!! As I understand the back ground plays a big act in the canvas. How about the blue color ocean and the sand ? Hi Zaineb, a yellow ochre with a little white added can work as a brilliant coloured ground for seascapes. Oh btw … I need biscuits:) I think that is the secret of your great art.